Only 5 km from Beberibe. The Praia de Morro Branco is internationally known for the sea cliffs that line the entire length of the beach. The sedimentary rock layers are subject to the erosive powers of both wind and water and vary in color. The area is within the boundaries of Parque Nacional das Falesias. A small group of fisherman still live in the village. Others have dune buggies and operate as tour guides. from any Fortaleza Hotel R$ 45,00 ! 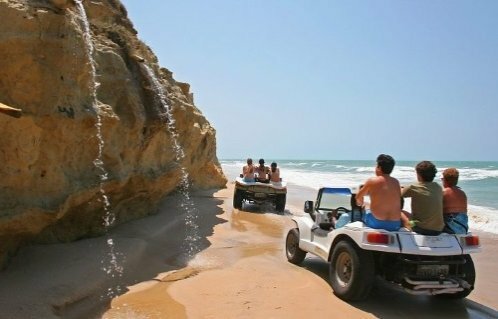 The main tourist attractions are buggy rides over the dunes, exploring the caverns and caves, and bathing in the natural springs. Not to leave out taking in the amazing sunset over the sea cliffs! 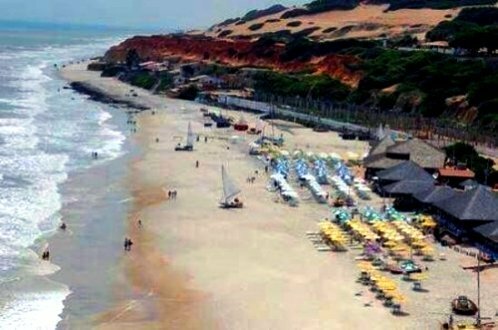 Well organized and a good choice for a weekend getaway from Fortaleza or a stop for lunch if you are traveling up the beach by dune buggy or 4 wheel drive. The "Barracas" (Bar-Restaurants) along the beach serve fresh seafood dishes. 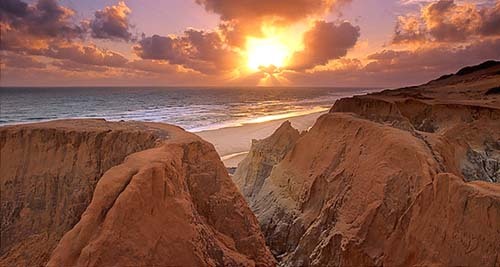 A number of films have been shot along the shores of Morro Branco such as Uma Vida de Paixão e Bocage, O Triunfo do Amor, O Noviço Rebelde e Bella Donna and the Brazilian soap operas Final Feliz, Terra do Sol and Tropicaliente.